Enjoy playing Ben 10 games? Well, check out the latest addition to our collection – Ben 10 Alien Unlock 2. The second part of the popular game Ben 10 Alien Unlock. The Omnitrix stabiliser core has been stolen by Khyber. Solve the mystery code and unlock new aliens to ultimately find & defeat Nemetrix and his aliens. 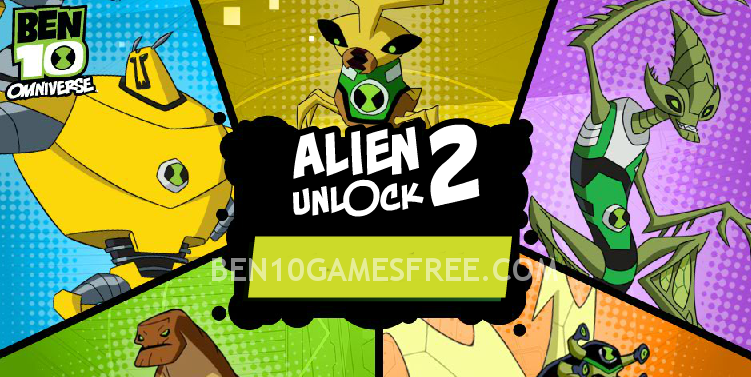 Just like the previous version of the game, Ben 10 Alien Unlock 2 is also a mission based game. Your aim is to reach the den of Nemetrix while his aliens army and robots try to stop you from getting there. In this whole journey, you need help from other Ben 10 aliens. You have to unlock these aliens by finding out the correct secret code during each mission. If you haven’t yet played the first page of this game, you must play Ben 10 Alien Unlock. Let us first know a little more about the game. Although this is one of the ben 10 omniverse games, there are some new aliens being introduced in Ben 10 Alien Unlock. The game begins with the first alien, Crashhopper and subsequently, you will unlock more aliens including Stinkfly, Ball Weevil, Armodrillo, and Humungousaur. In each mission, you have to reach the finishing point after collecting all the five letters of the secret code and as much as orbs as possible. Also, there is a timer running alongside and you must complete the mission before the time runs out. Pro Tip: Use the special powers to destroy aliens before they destroy you! But, things aren’t as easy as they sound. Nemetrix aliens who are the predators of Ben 10 aliens are in your way. The only way to win Ben 10 Alien Unlock 2 is to cleverly use superpowers, avoid attacks from predators and collects all the secret codes to unlock aliens. So, dear ben 10 fans, this is it. Now it’s is your time to get into the action and unlock some aliens! Collect all secret codes to unlock new Aliens and defeat Nemetrix to win! Good Luck!! Don’t Forget to give your rating for Ben 10 Alien Unlock 2 game and share your tips and tricks to win this game in the comments section below.